Tribal prints were huge this season and aztec is one of my absolute favourites!! The root of aztec goes back to Mexico where tribes that made up the Aztec empire wore aztec clothing. Clearly this erupting trend has evolved and modernized and is now recognized by it's colourful impact that commonly consists of a lot of lines and triangles. Because this print is so dramatic, keeping the rest of your look simple is the way to go. Especially if you are wearing a dress your accessories should be very minimal and your look should be finished off with a pair of flats. If you are wearing the print as a skirt pair it with a simple top, one colour no detail, and this I would recommend a fun accessory piece like a rad thick cuff, a playful necklace or tribal inspired earrings. Again depending on the style of your piece stick to flats as aztec is usually a more casual style however if you are dressing it up a tad pair your look with the perfect pair of wedges. I want to know with prints being so popular what your favourite has been this season. 1 Ally Fashion. 2 House of Harlow. 3 Ettika. 4 Ally Fashion. 5 River Island. 6 River Island. 7 Mara Hoffman. 8 H&M. 9 Asos. 10 All Saints. 11 Topshop. 12 Etsy. 13 Betsey Johnson. Love the aztec print every time! So much it was tough to narrow down my inspiration pics. And can you tell I'm obsessed with the print being worn on the bottom half the most? Great pictures! I love Aztec print! awesome post! love this trend! Thank you for stopping by my blog Marla :). I followed you back on bloglovin and google. I am following you via GFC, follow back? lovely post im obsessed with the aztec print. Thanks for the support in my blog, dear! Love yours! Really amazing style you've got too :) I'm your follower too! really like this post as well, going to read some more of your blog now! I love tribal inspiration, and aztec is definitely a favorite of mine. The first time I saw the skirt at All Saints I was in love! First time visiting, would you like follow each other? Oh I actually have that House of Harlow bangle from one of B-friends! I love love it! Is that All Saints piece a dress or a top? It's a dress but there is a top as well that is very similar. I used to not really like these prints but now I am loving it! I already made a summer dress from a bright Aztec fabric, ready for the warmer weather! I've been eyeing those All Saints pieces for seasons now! Love how they manage to incorporate my two fave trends, Aztec and sequins! Every item so haute and luxe, makes dressing for day that much more fun! Great mix! I totally agree with you. I think tribal print is best on bottom =) LOVE all the skirts.. thanks for the great inspiration! Totally love aztec prints too! Btw, thank you for visiting and following my blog. Following yours now. Love all of the aztec inspiration!! And thank you so much for the comment and for following my blog!! I am following you back with pleasure!! 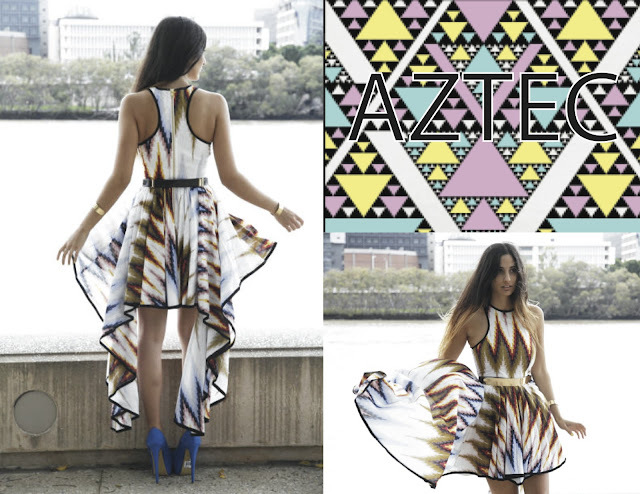 loooove the aztec print <3 your dress looks pretty too! I've been obsessed with aztec print for so long! The pieces you picked out here are great! You mentioned in your comment that you have a tattoo - what design did you get? I'm curious to find out! haha Henna is a good way to go if you're indecisive (like me!). I so love Aztec print too! Amazing post dear, such great pieces you have found ! very cool. dress on the firt picture!the best! I love any kind of tribal prints. Do you like to follow each other on GFC and bloglovin? Let me know will follow you right back. i love every single ITEM in this post, you have impeccable taste. Love that print. Thank you so much for the recent compliment on my blog of course i'll follow. hope you do the same! xO! Aztec prints are amazing! Love the trend!